Image: Art by Tim Buckley. “Loss” is one of the modern internet’s most pervasive, and most strange, memes. Now, it’s, uh, a little different. Some background: Ctrl-Alt-Del is a webcomic. A very old one, in fact. Beginning in 2002, the strip, written and drawn by Tim Buckley, has updated regularly for the past sixteen years, expanding from a special-interest gaming webcomic during the heyday of two-guys-on-a-couch gaming strips to a broader, more strange slice of life comic, before ending up somewhere between gaming parody comic, broad scifi pastiche, and postmodern nightmare. Its most iconic strip is “Loss”, which became a huge meme by virtue of its sheer incongruity. After years of silly gag comics and, uh, open letters to lawyer Jack Thompson, Buckley’s strip got suddenly very serious, culminating in strip depicting the protagonist’s wife having a miscarriage, a narrative move so unexpected that a lot of the internet found its existence darkly hilarious, leading to a sharp backlash and a lot of mockery. 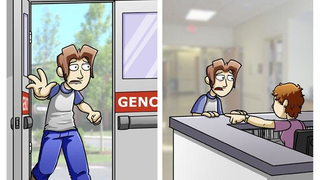 The original “Loss”, via Know Your Meme. Credit to Ctrl.Alt.Del. Yes, that’s right. It’s “Loss”, but the final panel is tweaked: instead of the protagonist standing in horror, he has a knowing smirk on his face. “Gotcha,” he seems to say, as his wife... suffers horribly. “I see you, memers.” Uh. What? What? Is this a prank? Is this Buckley’s nod to the popularity of the “Loss” meme? Was he hacked? What is happening here? Even more strangely, “Found” seems to have entirely replaced “Loss” in the website’s backend—comments on the “new” strip date back a year, and the original URL leads to a dead page. It’s not clear precisely when this appeared, but the Internet Archive has snapshots showing the original comic from as recent as May 20th, whereas the new “Found” only has one snapshot, from today, even though it’s backdated to 2008. The backdating does change the date from June 2nd to May 31st, 2008, however, suggesting that this might’ve gone through earlier this week. I, dear readers, am baffled. I’ve reached out to Tim Buckley, and I’ll update if he comments. tl;dr: Is this “Loss”? No, no it’s not, and I don’t know why. Update 6/3/18: Now, a day later, the offending comic is gone. It’s been replaced, again, by the original. Eerie.